According to a recent news article from 25 News Boston, police in Newton are investigating an incident in which a bike rider suffered a blowout caused by dozens of thumbtacks that appear to have been maliciously placed in a bike lane. Authorities are saying this was not the first time this had occurred as there have been a series of similar incidents in recent months. A spokesperson for the Newton Police Department has said they are not sure whether someone is on foot when placing the tacks or they are dropping them out of a car window. Police are relying on potential witnesses and other members from the community to provide them with any information that could help identify the person or persons responsible for this concerning series of attacks on bike riders in the Greater Boston area. While the incident may result in a flat tire, it could also result in serious personal injury to a bike rider. If the tire losses air rapidly, this could result in the bike rider losing control and crashing into other vehicles that are in a travel lane or parked alongside of the road. A rider could also lose control and hit the road surface, resulting in serious personal injury or even death. Wearing a bike helmet will certainly reduce the risk of serious head injury, including a traumatic brain injury (TBI), or broken bones, abrasions and contusions. To make matters worse, these tacks have been left on areas in which the riders are going downhill at a potentially high rate of speed, further compounding the danger. 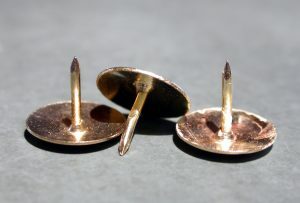 Police are also concerned the tacks could go through the shoe of a runner or pedestrian. However, in a case where someone is leaving thumbtacks in a bike lane, that would not be an example of negligence. This is because negligence is more than an accident at which nobody was at-fault, but less than a purposeful act like physically assaulting another person. Negligence cases are essentially careless acts in a situation where the average reasonable person in the same situation would have acted more carefully. If a person intentionally harms another, the proper legal action would be filed under a theory of an intentional tort such as a battery. Battery is defined as the harmful or offensive touching of another (without permission), and this harmful or offensive touching must result in some type of harm to a plaintiff. This harm to a plaintiff is what we refer to as damages in the legal context. Damages can include pain and suffering, lost wages, past medical bills, rehabilitation expenses, mental health treatment, and property damage. With respect to the non-permissive requirement in a battery case, in instances where a person knowingly engages in an activity where they might be harmed by another, like a football game for example, the injured person could not likely file a claim for battery because they would have consented or given permission to be harmed in such a manner. In the context of leaving thumbtacks in a Boston bike lane, there act of placing the tacks is intentional. When the rider hits the tacks, this would be the harmful or offensive touching of the person on another. While there were arguments in the past that hitting a bike tire is not the same as hitting a person, the law considers anything attached to a person to be the person in the context of a battery tort. For example, if you would walking down the street and someone ran by and grabbed your purse, the purse would be considered an extension of your body, and would be sufficient to establish the harmful contact element in a civil battery case. Leaving thumbtacks in a road bike lane is certainly one type of assault on a bike rider, but it is far from the only type to occur. Unfortunately, there have been incidents where people have purposefully driven too close to bike riders in an attempt to scare them, resulting in contact between the car and bike. This is not only a crime, but would constitute a civil battery. There are more cases where an angry and aggressive driver will try to scare the bike rider, and even though no contact is made, the fear of being hit causes the bike rider to lose control and crash. If there is an intentional attempt to scare a bike rider and this results in harm, there is another intentional tort theory that would be applicable to this situation. This is the intentional tort of assault. We often use the terms assault and battery together, and they may be the same in a criminal context, but in the civil realm, they are two distinct torts. Assault is the intentional placing of another in fear where they would have reasonable apprehension of imminent bodily harm. In other words, if a person thinks they will be hit by a car and takes evasive action, but is harmed while taking this evasive action, this would be an example of civil assault. These are just a few examples of intentional torts in Boston bike crash cases. While they may not be everyday occurrences, because of the extreme and unjustified negative attitudes towards bike riders exhibited by some in the community, they do occur from time to time as we have seen from these thumbtack incidents. The best thing you can do is to speak with an experienced Boston bike crash attorney about the facts of your particular incident to see if you have a valid claim.